186 pages | 3 B/W Illus. This innovative study re-evaluates the philosophical significance of aesthetics in the context of contemporary debates on the nature of philosophy. Lewis's main argument is that contemporary conceptions of meaning and truth have been reified, and that aesthetics is able to articulate why this is the case, with important consequences for understanding the horizons and nature of philosophical inquiry. Reification and the Aesthetics of Music challenges the most emphatic and problematic conceptions of meaning and truth in both analytic philosophy and postmodern thought by acknowledging the ontological and logical primacy of our concrete, practice-based experiences with aesthetic phenomena. 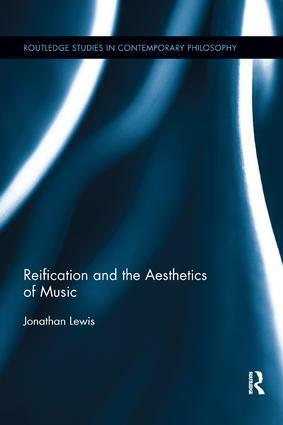 By engaging with a variety of aesthetic practices, including Beethoven's symphonies and string quartets, Wagner's music dramas, Richard Strauss's Elektra, the twentieth-century avant-garde, Jamaican soundsystem culture, and punk and contemporary noise, this book demonstrates the aesthetic relevance of reification as well as the concept's applicability to contemporary debates within philosophy.